In a previous issue, I noted that for-profit, corporate motives have infiltrated our public education system, resulting in the same sorts of power structures at community colleges as at Wal-Mart or at for-profit schools. In other words, we depend increasingly on part-time labor whom we can deny benefits or fair pay while compensating the top executives at rates never before seen. It is easy to argue that the seven major heirs to Sam Walton’s fortune could change the nature of the economy all on their own; it would cost a trivial amount of their comparative fortune to pay a living wage to their employees. Of course, nothing is ever so simple. Even the assertion that it would cost a 1 percent hike in prices to accomplish this is slanted news. 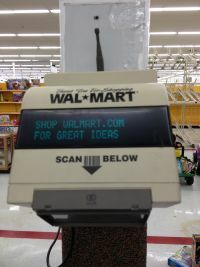 Wal-Mart is a publicly traded company, with shareholders making decisions about their market capitalization. In other words, we can’t know the consequences of Wal-Mart reversing their traditional stance on labor compensation. While this might be profitable for the company (their employees could afford to spend more money, probably most of it at Wal-Mart; they would benefit from improved retention and loyalty, etc. ), it might also collapse the whole endeavor. The problem is shareholders. In our economic system, shareholders have an inordinate amount of power in the marketplace. Worse, democratizing the stock exchanges by making it easier to buy and sell stocks for the average person has created a great deal of market volatility. And shareholders are not necessarily educated or excited about workplace ethics or social justice. They are concerned with the value of their portfolio. So giving everyone a raise in this culture of politics might be a bad idea. We are obsessed with the idea of the free labor market. Politicians eager for money to fund their re-elections parrot the notion that increasing pay for the bottom end of the market must reduce demand and will result in more unemployment. In this atmosphere, how might shareholders react to a sea change in how we treat labor? The fear is that a mass sell-off will ensue, resulting in decreased market capitalization for the company (be it Wal-Mart, McDonalds, or any of the other major offenders in the marketplace). These sorts of market manipulations happen all the time, with investors betting against start-ups and causing them to fail. Now here’s the problem: this sort of thinking has started to pollute the public sphere. Executive compensation is high, sports programs are thriving, and schools are building new facilities like never before. At the same time, full-time faculty workloads are increasing at an unprecedented pace while colleges pay less and reduce their full-time complements by replacing outgoing full-timers (especially ranked faculty) with contingent, part-time, adjunct employees. These employees are paid on average one third per course that of full-time, non-contingent faculty. (AAUP, 2014). You can follow some of these ongoing changes. But public education does not have shareholders in the sense of publicly traded companies. Again, the money is available (evident in ever-growing sports and administrative budgets and reserve funds—Colorado put away $100,000,000 in 2012 while moving ever forward in reducing costs from instruction, the basic mission of public education. It would be trivial, in comparison with the total cost of running the education system, to pay a living wage for adjunct faculty and to hire enough full-time faculty to bring workloads to sanity levels. With no shareholders to worry about, how is this thinking infiltrating the public sphere? The answer lies somewhere between high-end politics (with politicians inheriting their thinking and marching orders from people with profit motives and the financial power to pursue them) and ordinary voting. Paying employees became a huge political battle in Wisconsin in 2012, with organized labor the loser. The issue of faculty compensation in state schools must be politically toxic at this time, perhaps evidenced by the fate of Colorado House Bill 14-1154. This bill would have ensured fair compensation for adjunct faculty and fair workloads for full-time faculty, except that it got as far as the appropriations committee and was there postponed indefinitely. Only when the shareholders wake up to the unsustainability of our current labor practices—the actual existential phenomenological experience of what it really means to be a worker and a teacher and indeed, a human being, in this world—will they start to vote—in the markets with their money, and in the political sphere with their ballots—for better practices.